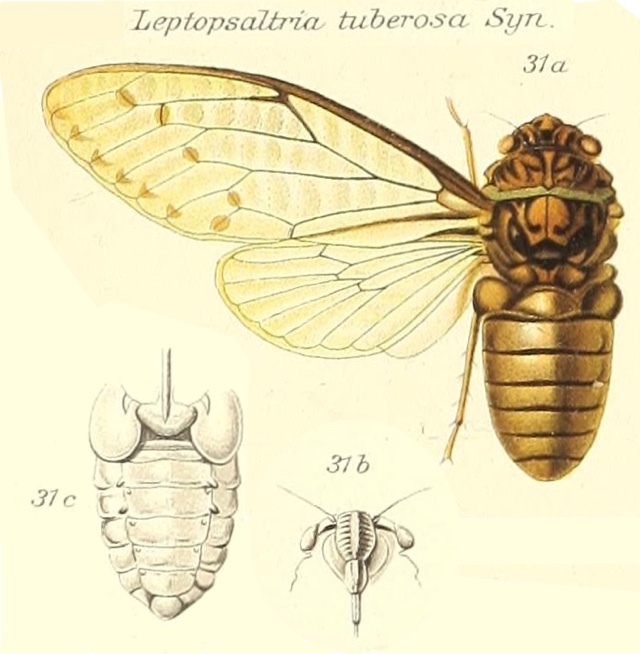 Leptopsaltria tuberosa (Signoret, 1847) is a cicada found in India, Japan, and on Java (Indonesia), according the the Genera Insectorum, 1913. That’s quite a range. Characters. — Head (including eyes), considerably narrower than base of mesonotum, ocelli not quite twice the distance from eyes as from each other, front somewhat conical and subprominent; pronotum with the lateral margins moderately ampliated and more or less distinctly toothed or angulated; genae internally at apex near base of lorae furnished with a tubercle or tumescence; abdomen moderately long and robust; anterior femora distinctly and robustly spined; rostrum extending beyond the posterior coxae; tympana covered; opercula short; second and third abdominal segments in the male furnished with a well-developed tubercle near each lateral margin; tegmina and wings hyaline, venation normal, tegminal apical areas eight in number.